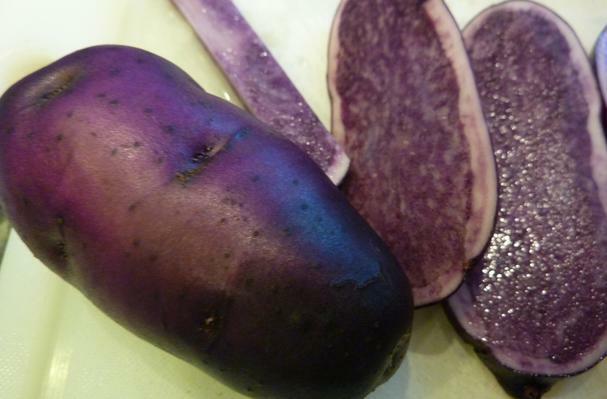 Blue potatoes' rich purple color comes from high production of anthocyanin, a compound noted for its strong antioxidant properties, making blue potatoes the most nutrient-rich of all the potato varieties. Blue potatoes are small and sometimes oblong. History: As with all potatoes, blue potatoes originated in Peru. However, they have an especially favorable history there. Traditionally treated as heirlooms, blue potatoes are gaining popularity and can now be found at local farmer's markets and Costco. Hi Guys; Ube Purple Yam IS NOT the same as "All Blue" potatoes. One is dioscorea alata, a tropical vine, and the other is a variety of solanum tuberosum, e.g. a potato.